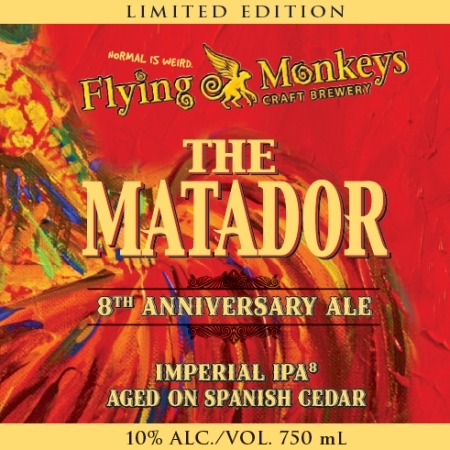 From Barrie Ontario’s Flying Monkeys Craft Brewery comes their 8th Anniversary Ale called the “The Matador Imperial IPA” which is aged on Spanish Cedar. The Double India Pale Ale pours a cloudy golden/orange colour with an off white head. The aroma consists of malts, citrus, fruit, cedar and hops. The flavour is of pine, hops bitterness, malts, cedar, orange, citrus, pepper, spices and some alcohol. The alcohol content of this brew is 10% and the IBU comes in at 88. This is a but kicking brew and will not be for everyone. If you are like me though and love a good kick in the but by hops then this will be your beer! Flying Monkeys has really crated a wicked double IPA here. Happy 8th Anniversary guy! Commercial Description: Aged on a bed of Spanish Cedar, a hardwood most commonly used in sweet-smelling cigar boxes, The Matador’s fabulous aroma cradles a spicy, peppery zing in the rich warm smells of leather and wood. Amarillo hops give this Imperial IPA astonishing citrus flavours while pushing its bittering to a solid 88 IBUs. A beer made fro sharing with true aficionados. 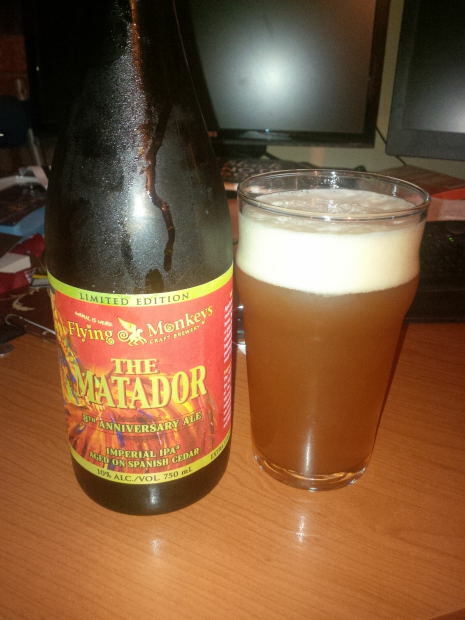 Normal Is Weird… Even 8 Years Later The Matador Imperial IPA commerorates the eight-year-long, life-and-death spectacle of the Flying Monkeys Craft Brewery. 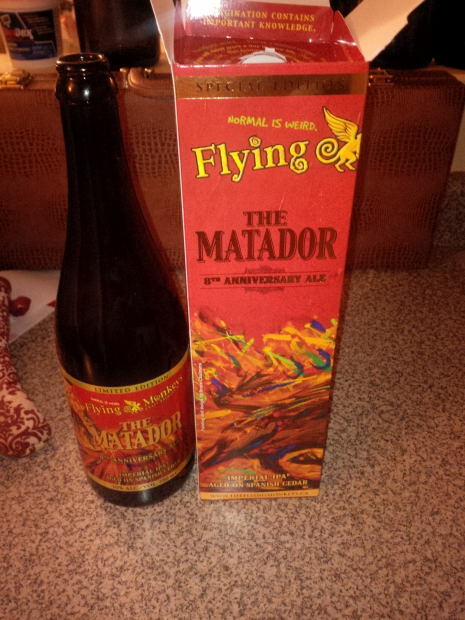 Honouring the “art in the flight” for independent craft brewers in Ontario, we see the matador as a spiritual reflection of ourselves -dynamic, paradoxical, energetic, and fluid. Ole! This entry was posted in Double IPA, Imperial and tagged 8th anniversary, @notbuncy, aged, alcohol, barrie, bitter, bitterness, canada, cedar, citrus, double india pale ale, double ipa, extra strong beer, hops, hopy, imperial, imperial india pale ale, imperial ipa, india pale ale, IPA, malt, malts, malty, ontario, orange, pepper, pine, spanish cedar, spice, spices, wood.